When you first log in, you’ll be taken to the Home screen of the Survey Tool. Here you’ll find everything you need to get started. You can always return to Home by clicking on the logo in the top left corner. For future logins, you’ll always be taken directly to the last tool you were working in during your previous session – Survey, Assessment, or Poll. Got no time for a tour? No worries! If you skip everything else, check out these two options – boldly front and center in your account. Create Survey: Exactly as it sounds, this button is the one you need to create a survey from scratch, copy any of your previous surveys (if you have any! ), or select from the Survey Bank. Survey Bank: Not ready to start from scratch? Gather inspiration from our expert-designed bank of sample surveys. 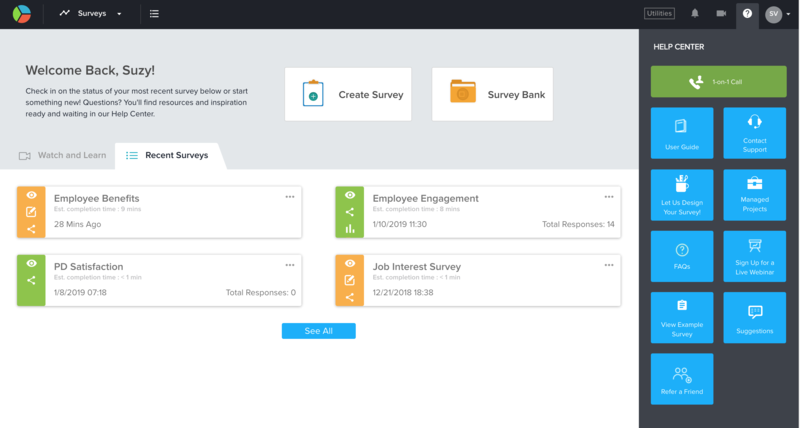 These complete survey templates apply to a wide range of audiences and purposes, and can be previewed for a quick look, downloaded to review offline or share with a team, and even copied directly into your account for customization – and a quick launch! Survey, Poll, or Assessment? In the top left corner of the screen, click the tool that suits your project. Survey Tool: From questions to answers, we’ll guide you through every step of designing your perfect survey, distributing, and reporting. Poll Tool: It’s easy to collect feedback – serious or silly! – in a single-question poll that’s quick to generate and simple to share. Assessment Tool: Assessments are similar to surveys, but with additional quiz functionality on top! Make the most of each evaluation with automated scoring, displayed timers, customized follow-up, and more! Rename: Click on the survey title itself to revise the name, then confirm your change. Edit: Hover over the survey and click on the pencil icon that appears to the right. You’ll be taken directly to the Design module so you can make any necessary changes to your survey. Preview: Hover over the survey and click on the eye icon to the right. A new tab will open to display your survey exactly as it will appear to participants. Publish: When you hover over the survey, you’ll see a publish icon to the right. Click on this icon and you’ll be taken directly to the menu of distribution options so you can launch quickly. Report: Hovering over your survey will reveal a bar graph icon to the far right. Click on this icon to dive straight in to the Report module and start your analysis. Export: Once you hover over your survey, you’ll see an Export icon on the far right. Click here to be taken to the Data module, where you can export into a variety of formats or import new data. Move to: Re-organize your account by moving the selected survey to a new folder. Copy: Save time by instantly duplicating the selected survey ‘In This Account’ or ‘Into Different Account’. If you’d like to copy into a different account, you’ll need the account’s User ID. The administrator of that account will receive a notification and can decide whether or not to accept the copied survey. Download: Whether you need an offline version of this survey for your own review, to collect team feedback, to generate paper versions, or anything else, you’ve got it! Adobe PDF downloads a clean, un-editable document. You may search for certain words within the document, for example, but you cannot edit text or images. MS Word downloads a copy of the survey in Microsoft Word format, allowing you to edit text, images, margins, and other details. Scanner Ready format also opens an editable copy of the survey in Microsoft Word. However, the extra spacing and wide margins of this format make it more conducive to scanning paper results via a third party. Expiry Rules: Choose when to expire your survey – now, based on a certain condition, or when the account expires. No matter where you are in the platform, you can always click on the question mark icon in the top right corner of your screen to access this panel of resources. 1-on-1 Call: Depending on your account type, you may see an option to schedule a quick consultation with one of our survey experts. Use these calls to check in on technical questions or ensure you’re following best practices in your project. User Guide: This comprehensive knowledge base is designed to address all of your questions about our platform. You’ll find videos, step-by-step tutorials, and even feature descriptions to help you explore new options you might not have considered. Contact Support: Use this form to submit your questions directly to our support team. Plus, including additional details like browser and operating system can help us help you! Let Us Design Your Survey:Our Survey Design Services package makes your next survey project a breeze! Give us your content, and we’ll build your survey for you! Click this option to find out more or to get started. Managed Projects: Need more help? Opt for our Managed Project service, then put your feet up! From start to finish, we’ll help design, distribute, and report on your next survey project. Share your requirements and we’ll be glad to follow up and discuss. FAQs: Drill down right to the questions that come up most often. Find quick answers, video tutorials, and detailed explanations from our product experts. Sign Up for a Live Webinar: Join a training or webinar for insights on how to make the most of the platform, improve your practices, and more. Suggestions: Got an idea for a new feature or an improvement on a current feature? We’re all about feedback, and we love hearing from you! Your suggestions will be carefully reviewed by our product management team in planning future releases and updates. Refer a Friend: Know someone who’d benefit from SoGoSurvey? Send a referral and you’ll benefit, too! Click here to learn more about our Referral Program. If this is your first time in this account, you’ll only see videos here. Later, you’ll have quick acccess to recent surveys, too. Watch and Learn: These videos provide a solid overview of each module of the platform, from design to distribution and from reporting to data management. If you’re looking for details regarding a specific feature, click on the link to the Video Library. Recent Surveys: It’s easy to review and return to your most recent projects in this section. Each survey’s color indicates it status – yellow for Edit, green for Active, and red for Expired – and you’ll see quick high-level stats, as well as status-specific options on the icon menu on the left of each card and in the dropdown menu in the top right.